It is interesting that two plants we might find growing in our gardens have such strong connotations with winter and the Christmas period. Pagans had customarily decorated their homes in winter with evergreens culled from the landscape long before the birth of Christianity and many people still put holly wreaths or garlands on their door or bring greenery inside at Christmas. 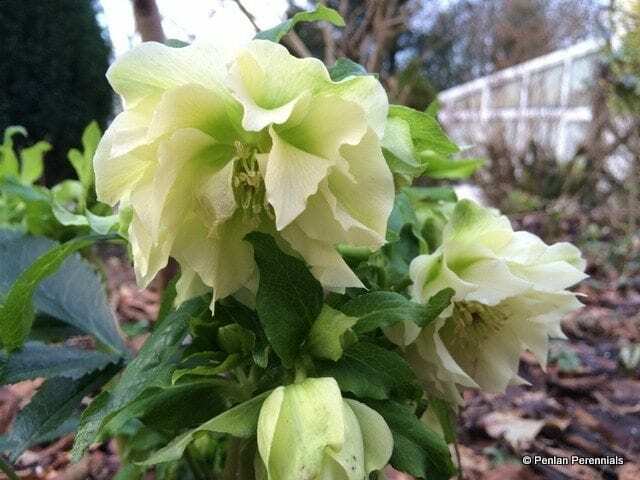 Many other myths surround this most popular of all Christmas plants. It supposedly wards off witches and wandering spirits. It was hung in homes to assure the occupants had good luck as the “points” would snag the evil-intentioned and prevent them entering. A syrup made from holly allegedly cures coughs. A sprig of holly on a bedpost assures one of pleasant dreams and many other such myths. Holly and ivy have been the mainstay of Christmas decoration for church use since at least the fifteenth and sixteenth centuries, when they are mentioned regularly in churchwardens’ accounts, but many of the specific traditions we have today are only found in much later accounts. The holly and the ivy have even closer associations if we look at the plant symbology behind them. Our ancestors were more attuned to the land than we are and paid far more attention to plant relationships than we do, noticing the rivalry between the two plants vying for mastery of the forest. They became associated with the sexes, holly being masculine and ivy feminine. Holly was considered rigid and prickly whilst ivy was soft, rounded and feminine! When holly was brought into the house, it became an object of lively interest and speculation. It was (incorrectly) believed that the very sharp “pointed” leaves were male, the smoother leaves female and thus the type of holly determined who should “rule the roost” in the coming year, the man or the woman! Victorian merchant, Henry Mayhew estimated that London merchants sold 250,000 bushels of holly during Christmas 1851. Christian tradition also assigns great significance to holly. According to tradition the pointed leaves represent the thorns of Christ’s Crown whilst the perennial green leaves represent eternal life. The red berries represent the blood shed for our salvation and there is also a belief that holly was used to make the crown of thorns. At that time the berries were yellow but in honour of the blood shed by Christ the berries turned red. Whilst holly is most often pictured with red berries they come in other colours and tradition says that white berries represent Jesus’ purity, green berries the cross of wood and black berries his death. If we look at the words of the famous Christmas Carol we can see the symbolism in most verses. This particular carol is different from the others in that it blends both pagan and Christian ideas, symbols and sentiments. The typically pagan symbols of holly and ivy were originally associated with an ancient fertility dance dating back over a thousand years and there are several versions, this one published by Cecil Sharp in 1911. It is very unusual for a carol like the Holly and the Ivy to have survived over the years especially during the stern Protestant period of the 17th century, so great importance must have been attached to the carol by common folk, who defied the ban on Christmas by Oliver Cromwell and the puritans, by tying up rough bunches of ‘holy’ boughs of evergreens. Until the start of the 1800s it was the evergreen bough that was brought indoors rather than the tree made popular by Prince Albert. On looking closely at the words it is interesting to note that although it appears in the title it is barely mentioned at all in the lyrics! Why is the carol not titled simply “The Holly” instead of “The Holly and the Ivy?” This can be answered by reference to the first verse which reverts to a pagan rather than Christian theme. The reference to the holly’s “crown” in the first verse now makes more sense, as does the inclusion of the ivy. While pagan memories of a Holly King play an unconscious role in reference to the “crown” the primary meaning is that the holly and the ivy are vying for supremacy and holly wins this time, although in other old songs such as “Ivy, Chief Of Trees” it is the ivy that carries the day. Reverting back to a gardening theme it should be noted that many holly species have the pistillate (berry-bearing flower) on one plant and the staminate (pollen-bearing flower) on another plant, so it is always advisable to plant more than one in your garden. 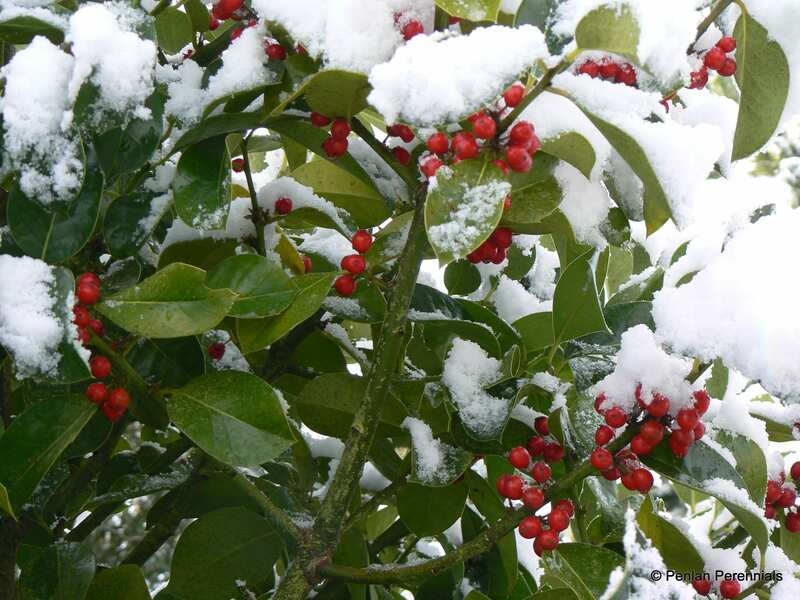 Hollies bear their fruit best in colder climates and can withstand freezing temperatures so grow well here in Wales, where some holly trees are over 200 years old. The bright red berries of Ilex aquifolium (common Holly) ripen in October and remain throughout winter if you are lucky, although in our garden migrant Fieldfares and Redwings vie with Mistle and Song Thrushes to polish off most of the fruit before we get round to making our Christmas wreath!